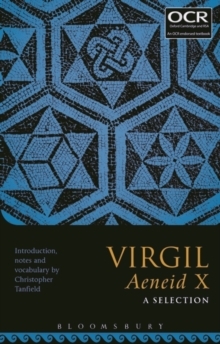 This is the OCR-endorsed publication from Bloomsbury for the Latin A-Level (Group 4) prescription of Virgil's Aeneid X, giving full Latin text, commentary and vocabulary for lines 215-250, 260-307, 362-398 and 426-542. A detailed introduction covers the prescribed text to be read in English for A Level. In Book X, the story moves from a council of the gods, via a depiction of Aeneas's return by sea to his beleaguered Trojan camp, to a bloody field of battle. We see Aeneas for the first time as a heroic warrior, but also afflicted by the searing pain of loss as the young son of his new ally, entrusted to him by his father, is killed. Aeneas is for now cheated of his revenge, a revenge which is the preoccupation of the rest of the poem. He does, however, slay the son of a champion of the opposition and then the champion himself, in scenes which re-emphasise that pain. The heart of the book, where Aeneas and his allies join the fray, constitutes the OCR selection. It is an immensely powerful confrontation between violence and compassion, cruelty and nobility.